When Josh Bersin, an international thought leader in HR & leadership, shares his perspective on Employee Experience, our teams at Spencer tend to tune in. So when he recently called us one of the key vendors in employee experience platforms, after essentially summarizing our business case, we couldn’t help but paraphrasing his vision into our product’s reality. Time to showcase how Spencer, the employee assistant, successfully applies Bersin’s theory for its customers. Yes — your employees are overwhelmed by the volume and diversity of software tools and their pace of change. And yes — as consumers we are all used to the convenience of applications such as Netflix, AirBnB or Uber. Resulting in high expectations, that aren’t always met by our tools at work. The solution to the problem, according to Bersin? That’s right! Over the last 2 years we’ve been training Spencer to proactively assists our customer’s workforce through employee-centric journeys, across functions and departments. Empowering & connecting employees, boosting productivity by making the tools you trust work better together. Read on below the video or get in touch if you’d like to learn more! #1 –– Empower, engage and reach all your employees in a convenient way, in line with your company culture and brand. Spencer improves employer branding, employee engagement and talent acquisition/retention in a globalized and transparent job market. At Delhaize (Retail, Ahold Group), 96% of employees indicated Spencer helps them every day. #2 –– Increase productivity & profitability. Spencer aggregates actions & information from different systems in one consistent user-interface. Proving his return on investment, by saving time, accelerating decision making, improving quality, and process adherence across the board. At Proximus (Telco), we’ve improved the productivity of their Employee Self Service processes with almost 70%. #3 –– Digital transformation made simple. Spencer is designed for employees, there’s no training or change management needed. But most of all, upgrading to new back-end systems becomes transparent to the end user. Spencer allows companies to transform their ecosystem at lightning speed, whilst guaranteeing a convenient and consistent employee experience. On a mission to empower their diverse workforce with an intuitive Employee Self Service (ESS) suite, Proximus (Telecom) turned to Spencer. Instead of disrupting the core blocks in their IT ecosystem, they wanted to keep SAP HR in place and add a new experience & productivity layer on top. Spencer always starts from the employee’s perspective. So instead of answering to the RFP, to bring existing processes or screens to a mobile device format, we decided to take a step back. What would the ideal employee journey look like? Imagine you have 10 vacation days left, combined over three absence types. In the existing SAP HR solution, booking a holiday would require three separate requests (one per absence type). But as an employee, wouldn’t you expect just one step, simply select the 10-day period? So that’s exactly what Spencer does. One step for the employee, while Spencer manages all transactions involved in the background. And because he’s a pro-active assistant: he will also block your calendar, help you manage conflicting meetings, remind you to set your out of office, and inform your team. Ticking every box on your checklist, so you can go on holiday with peace-of-mind. A year ago, Spencer was introduced to 8.000 employees at Proximus, from top management to technicians, from desk to deskless workers. Within a few months, our adoption rate grew to 95%. Even though legacy systems are still available, 95% of employees actively chose to install Spencer on their private/personal smartphones, regardless of role, age, or department. The qualitative feedback on Spencer’s convenience, and ease of use positively reflects on the employee engagement and the employer perception. On top of that, we’ve benchmarked the time spent in the previous workflow to request and approve time off, versus the process in Spencer, only to conclude that Spencer generates significant time-savings, equal to 30k EUR every week. Moreover, 30% of sessions take place outside of business hours, which adds another surplus to the ROI, both on the value for employees (convenience factor) and on the productivity metrics. Spencer’s ROI cannot be reduced to one metric. It’s the combination, and correlation between the qualitative benefits of a new System of Experience, and the quantitative benefits of a System of Productivity. 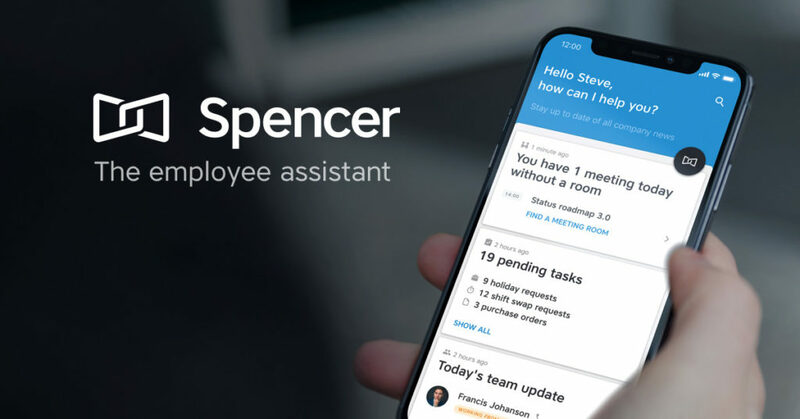 Lastly, as a “layer on top”, Spencer enables fast-paced digital transformation without disrupting your workforce. Most of our customers start their search from a very specific, and sometimes narrow, problem statement, unique for one department or unit within their organization. They want to be able to “communicate to the entire workforce”, “optimize time tracking and billables”, “flag company incidents rapidly” or “give access to their ESS on mobile”, etc. With Spencer, we’ll always take the opportunity to assess things from the employee’s perspective, across functions and departments. Because an employee looks at his company as a whole, and expects a consistent experience whether he’s reading the latest intranet post, requesting time off, approving a timesheet or reporting an incident. This typically results in a roadmap of employee journeys that we’ll be facilitating ranging from Employee Self Service functionalities to communication, collaboration and operational tasks. 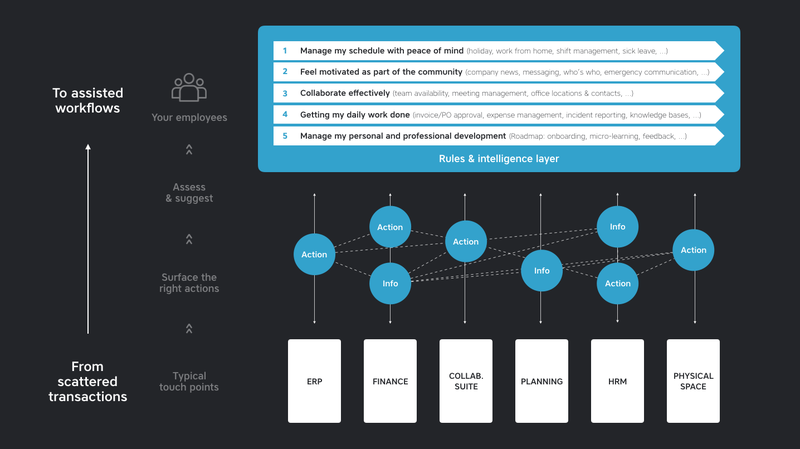 In the end, our goal is to deliver an impactful employee experience across departments, connected with the relevant back-end systems and in line with the company culture, identity and physical space.